Microsoft’s highly anticipated Zune introduction has turned into a debacle. Microsoft hasn’t built any brand recognition for the Zune. According Piper Jaffray analyst Gene Munster, only 8% of retailers recommended Microsoft’s Zune, while 75% recommended Apple’s iPod. More alarming are some of the responses when Munster’s team asked salespeople about the Zune. “I’ve never heard of the Zune,” one clerk said. The Inquirer notes that the Zune is getting laughed out of the US. The Christian Science Monitor says Microsoft’s muscle hasn’t helped Zune. 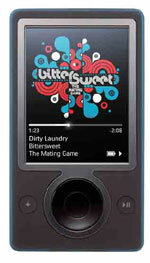 Reviews of the Zune have largely been negative, with some going so far as saying the Zune zucks. The Zune’s wireless features violate the spirit of Creative Commons licenses. What went wrong with Microsoft’s Zune introduction? “The Zune is incompatible with every single online service on the planet, even those that utilize Microsofts PlaysForSure technologies. Zune’s marketing is abysmal, while Microsoft appears to be going to great lengths to mimic everything about the iPod it can while offering virtually no real benefits over Apples dominant solutions,” adds Thurrot.